EHS Seminar / UL Forum NEW! Single-sided, double-sided, and multi-layered printed wiring boards, flexible printed wiring boards, build-up wiring boards, flex-rigid printed wiring boards, ceramic wiring boards, metal (copper, aluminum, etc.) based printed wiring boards, other printed wiring boards, and related books, etc. Functional design (circuit design for functional requests) technology, logical design (circuit diagram design) technology, parts layout design and bill of materials, pattern design, layout design, structure design, various design support tools (for the above listed technologies), signal integrity design support tools, power integrity design support tools, electromagnetic field analysis (measures for EMC/EMI/SI), electrical, mechanical, and thermal property simulators, CAE devices such as CAD, CAM, CIM, and related books, etc. Inspection and assessment contract services, various kinds of inspection devices, various testing devices, evaluation/analysis systems, inspection jigs, and related books, etc. Rigid copper clad laminates (CCLs), flexible copper clad laminates (FCCLs), shield boards, multi-layer PWB prepregs, copper foil with adhesive, ceramic board materials, copper/aluminum board materials, special board materials, various insulating materials, solder mask materials, and related books, etc. Plating, mold casting, hole drilling, plate making, plating chemicals, surface processing chemicals, etching chemicals, various inks, pastes, various tools, dry film resist, and related books, etc. Chemical processing device, photolithography exposure equipment, machining equipment, transportation equipment, coating equipment, plasma processing equipment, laser processing devices, printing equipment, and related books, etc. Water pollution control system, waste material and liquid processing, global-warming prevention system, air pollution control system, land contamination prevention system, noise control system, energy conservation system, CO2 reduction system, heat utilization (such as heat exchangers/waste heat utilization systems/thermal storage systems), and related books, etc. Transportation, packaging and packing equipment, embossed carriers, trays, tubes, internal and external boxes, logistics system, transportation system, trade control service, procurement and commissioned production, ordering system, drawing and documentation control systems, security systems, inventory control systems, traceability control, warehouse control system, intellectual property management systems, IT solutions, and related books, etc. Rigid substrate, build-up substrate, tape substrate, COF/TAB, ceramic substrate, lead frame, wafer-level package, two-dimensional package (SiP), three-dimension packages, silicon interposer, glass interposer, MEMS interposer (with rewiring layer), functional layer interposer, rigid active device embedded substrate, flexible active device embedded substrate, rigid passive device embedded substrate, flexible passive device embedded substrate, module device embedded substrate, IPD device embedded substrate, MEMS device embedded substrate, LTCC, bare dies, WLCSP/WLP, BGA (CSP), LGA, QFN, Chip parts, complex chip parts, IPD, modules of various types, MEMS, books on related topics, and related books, etc. Core multi-layered PWBs, organic package substrate materials, various alloys (Fe-Ni, Cu), polyimide film/tape, ceramic board materials, silicon wafers, glass blanks, organic/inorganic rewiring layer and materials, metal plates/radiator plates, metal stiffener plates, semiconductor insulating layer materials, optical wave guide materials, solder mask materials, organic/inorganic board (insulating) materials, copper foil carriers, film carriers, and related books, etc. Plating, mold casting, hole drilling, plate making, plating chemicals, surface processing chemicals, etching chemicals, various inks, pastes, various tools, dry film resist, die bonding materials, bonding wire, solder balls, bump materials, metal barrier materials, sealing resin, underfill, coating materials, various adhesives agents, conductive/nonconductive film, conductive/nonconductive paste, metal masks, and related books, etc. Chemical processing device, photolithography exposure equipment, machining equipment, transportation equipment, coating equipment, cleaning equipment, back-grinding equipment, CMP equipment, dicing equipment, wire bonders, die bonders, flip chip bonder, dispenser, plasma processing equipment, laser drilling equipment, RIE (Reactive Ion Etching) equipment, laser marking equipment, laser trimming machine, thermosetting device, printing equipment, and related books, etc. Water pollution control system, waste material and liquid processing, global-warming prevention system, air pollution control system, land contamination prevention system, noise control system, energy conservation system, CO2 reduction system, heat utilization (including heat exchangers/waste heat utilization systems/thermal storage systems) and related books, etc. Printed wiring mount board (printed wiring board on which electronic components are mounted and electrically interconnected; eg., AV or digital home appliances, mobile devices, automobiles, PCs and PC peripherals, household appliances and industrial equipment, and motherboards for powered devices), mounted module substrate (a module substrate on which electronic components are mounted and electrically interconnected; eg., AV and digital home appliances, mobile devices, automobile, PCs and PC peripherals, household appliances and industrial equipment, and module boards and IC packages for powered devices), insertion device mounted board, chip component mounted board, IC package mounted board, wire bonding mounted board, TAB/COF mounted board, flip chip mounted board, other electronic circuit boards, memory and storage devices, general-purpose logic ICs, transistors, diodes, optical semiconductors, sensor/imagining elements, high-frequency devices, microcomputers, ASIC, specific-purpose ICs (for use in TVs, AV equipment, communications equipment, in-car devices, and peripherals), general-purpose linear ICs (power supply ICs, motor drivers, LED drivers, transistor arrays, operational amplifiers and comparators, intelligent power devices (IPD), etc. ), and related books, etc. Packaging and structural design technologies, functional design technologies, logical design technologies, part layout design technologies, bill of materials (BOM), pattern design, layout design, various design support tools, 2D CAD, 3D CAD, digital mock-up tools, knowledge management systems, plotters/printers, CAM, process simulators, CAE (mechanism analysis, structure analysis, thermo-fluid analysis, resin flow analysis, casting analysis, electromagnetic field analysis, press analysis), analyzing service by contract, and related books, etc. Electronic circuit mounted board/ semiconductor integrated circuit inspection and assessment contract services, various kinds of electronic circuit mounted board and semiconductor integrated circuit inspection devices, various kinds of electronic circuit mounted board and semiconductor integrated circuit testing devices, various kinds of electronic circuit mounted board and semiconductor integrated circuit evaluation and analysis systems, burn-in devices, logical testing devices, memory test devices, linear testing systems, inspection jigs, testing, inspection and assessment contract services, and related books, etc. Electronic circuit boards, module substrates, wafers, mask materials, solder, lead frames, molding compounds, packaging materials, product structural components, other main materials used in the manufacture of electronic circuit mounted boards, development services by consignment, and related books, etc. Processing equipment and materials such as agents, chemicals, pastes, films, jigs and tools for manufacturing printed wiring mounted boards (including for processes such as mounting, embedding, insertion and assembly of parts and devices), processing equipment and materials such as agents, chemicals, pastes, films, jigs and tools for manufacturing mounted module substrates (for processes such as die layering and stacking, embedding and assembly, dicing, bonding, packaging, sealing, marking, soldering and other mounting and assembly processes), processing equipment and materials such as agents, chemicals, pastes, films, jigs and tools for manufacturing semiconductor integrated circuits (for processes such as single-crystal processing/exposure, depiction/resist processing/etching/heat treatment/ thin film formation/ion implantation/ washing and drying, etc. ), various types of machine tools for device production, casting, defining/washing equipment, various transportation systems and equipment, pure water/ liquid agent/water treatment equipment, various types of gas devices, clean rooms, control equipment, FA systems, and related books, etc. Printed electronics substrate (rigid and flexible), display products (organic TFT, organic/inorganic EL, LCD, electronic papers, wearable displays, 3D displays, POP displays, etc. ), next-generation lighting, AC EL lighting, light control film, electrophoresis, chemical compound solar cells, die sensitization solar cells, organic film solar cells, fuel cells, capacitors, flexible speakers, flexible actuators, antenna modules, RFID, printed memory, printed tags, smart labels, organic devices, light circuit/light communication devices, electromagnetic wave shielding film, ceramic capacitors, thin-film transistors, organic transistors, sensor modules, and related books, etc. Conductive materials, semiconductor materials, dielectric materials, insulating materials, metal nano-particles, oxide semiconductors, flexible sheets, and related books, etc. Conductive ink, insulating ink, ink-jet ink, metal colloid, organic EL, color filters, orientation panels, encapsulation materials, barrier materials, transparent conductive film, functional film, light-curing materials, photoelectric conversion materials, photocatalysts, polymer semiconductor materials, and related books, etc. Various design simulations, molecular design software, design tools, analysis tools, ultra-high-precision measurement machine design tools, and related books, etc. Surface defect inspection device, layer thickness measurement devices, film defect inspection device, contact angle measurement device, various electronic microscopes, transmittance measurement device, uneven layer thickness analysis device, organic EL brightness assessment system, phase difference measurement device, polarization measurement device, brightness measurement device, illuminance measurement device, chromaticity measurement device, retardation measurement device, spectroscopic ellipsometer, spectral interference layer thickness measurement device, and related books, etc. Ink-jet printing devices, nano-imprint devices, micro contact printing, dispenser, laser abrasion, laser transcription, gravure printing (including gravure offset printing), screen printing (including rotary screen printing), flexographic printing, transfer printing, Roll to Roll pattern forming, photo lithography, fine pattern exposure device, coating, drying, curing, and burning devices (ultraviolet ray, electron beam, far-infrared ray), heat laminate device, surface processing device, and related books, etc. Semiconductor Silicon, chemical compound semiconductor materials, organic semiconductor materials, magnetic materials (ferrite), dielectric materials, electronic parts materials, electronic parts metal materials, permanent magnets, bond magnets, piezoelectric ceramics, quartz materials, non-lead piezoelectric materials, liquid phase method materials, electrode materials, piezoelectric film (ZnO, AIN, PZT), sapphire, polymers, LTCC substrates, glass substrates, Si, and related books, etc. Film-forming and wiring materials, film-forming materials for CVD and ALD, CVD materials and gasses, ion injection gas, photo masks, liquid immersion lithography materials, photo resist materials, etching fluid and gas, CMP polishing materials, various detergents, various synthetic materials, various additives, surface-active agents, various solvents, tape or pasting materials, adhesives, protection materials, nanotubes, film materials for MEMS (e.g. getter materials), polymer materials such as dendrimer, polymer materials, sterile clothes/gloves/masks/shoes/caps, clean rollers/wipers/various rolls/brushes, static charge free products/dust-free products, clean room/clean bench/isolators, films/mats/sheets, particle counters, air conditioners, filters, other cleaning-related tools, and related books, etc. Hardware design solutions (system LSI, ASIC/ASSP, MPU/DSP, FPGA/PLD devices, EDA), function design, logic design, layout design, structure design, signal integrity design support tools, power integrity design support tools, electromagnetic field analysis tools (for EMC/EMI), electrical, mechanical, and thermal property simulators, CAE support equipment such as CAD, CAM, CIM, and related books, etc. Inspection consignment services, burn-in device, logic test equipment, memory test equipment, linear test system, various inspection devices, various test devices, waveform measurement devices, transmission characteristic instruments, wireless communication measurement devices, semiconductor/IC measurement devices, industrial measurement devices, evaluation/analysis systems, inspection jigs, and related books, etc. Wafer processing equipment, single crystal production device, exposure/depiction device, resist processing equipment, etching equipment, dry etching device, heat processing device, thin film forming device (CVD devices, sputtering devices, etc. ), ion injection device, CMP equipment, cleaning-drying equipment, various transportation systems and equipment, pure water/chemical liquid/water processing equipment, various gas devices, dicing equipment, micro/nano dies, nano imprint device, ion beam processing equipment, micro radiation processing equipment, sheet forming equipment, extrusion/casting/injection molding machine, pressurized forming equipment, laser micro processing equipment, thin film coating equipment, drying furnaces, burning/sintering equipment, microwave heating equipment, dissolution process equipment, fracturing process equipment, ultrasound processing equipment, wafer bonding equipment (aligner), deep etching equipment (for MEMS), clean room equipment, and related books, etc. High luminance LED, organic EL, electronic circuit boards for mounting power IC/IGBT/inverters and other high power devices, or electronic circuit boards already mounted with the above, LED/OLED (Organic EL) lighting devices, lighting modules/units, various types of display devices, display backlight units, in-car units, LED/organic EL lighting implements and devices, LED/OLED lighting control systems, power supply, driver IC controllers, and related books, etc. Crystal substrates, electrode materials, glass substrates, resist materials, phosphor, ceramic materials, organic EL materials, lead frames, and related books, etc. Bonding wires, molding materials, binding/sealing materials and pastes, resins, heat sinks, heat-release/heat-resistance materials, coating　materials, solder, masks, desiccant, reflective material, lenses, metal mold, polarizer, light reflector, optical film, and related books, etc. Optical design tools, thermo-fluid analysis tools, structural analysis tools, CAE/CAD/CAM and other design support tools, PLM/CPC/PDM, and related books, etc. Appearance inspection system/surface inspection system, LED/OLED measuring instrument, luminance measuring instrument, thermal resistance measuring instrument, color measuring instrument, illuminance measuring instrument, spectroscopic/photometric measuring instrument, current/voltage measuring instrument, acceleration/life testing machine, and other inspection/measurement/test/evaluation related instruments, and related books, etc. Coating equipment, resist processing equipment, exposure device, etching equipment, bonder, joining machine, molding/sealing-process-related equipment, cleaning equipment, carrier device, clean-related equipment, anti-electrostatic equipment, water processor, gas/chemical supplying device, lighting module, unit assembly equipment, mounted device, and related books, etc. Industrial equipment and communications, such as electric wires, cables, connectors, electric wire processors, AWM, wire harness processors, and electric wire or cable measuring instrument, and related books, etc. 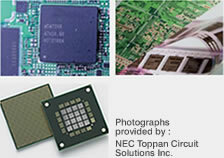 Leading-edge products based on high-density or high-frequency packaging technologies, high-density substrate and interposers, component contained boards, semiconductor chips, systems in package (SiP), systems on chip (SoC), indication/optical devices and sensors, materials related to high-density packaging, pastes, lead-free solder and junction materials, sealing resins, adhesives,, and underfill materials, anti-heat materials, high frequency ready polymer, systems and devices related to high-density packaging such as bonders (e.g. wire bonders, die bonders, and LCD/COG bonders), dispensers, flip chip (FC) packaging, BGA/CSP assembly, TAB packaging, OLB/ILB systems, and COB systems and equipment and production facilities, and related books, etc. ●Where products and technologies overlap between two or more exhibitions or zones - for example, if a company is exhibiting on the JPCA Show PWB Technology, but its products and technologies match the Large Electronics Show’s PE PROCESS, the exhibitor will be requested to exhibit on both the exhibitions, or even if the exhibitor prefers to exhibit only in the exhibition of their choice, we will make arrangements for visual aids to let visitors know that the exhibited products/technologies overlap with a different exhibition. ●In order to support the speedy resolution of design-related or functional challenges faced by users, the entire exhibition floor will be divided into six functional zones, with products in the same category grouped under the same zone, or signs put up to show which zone an exhibit rightly belongs in.